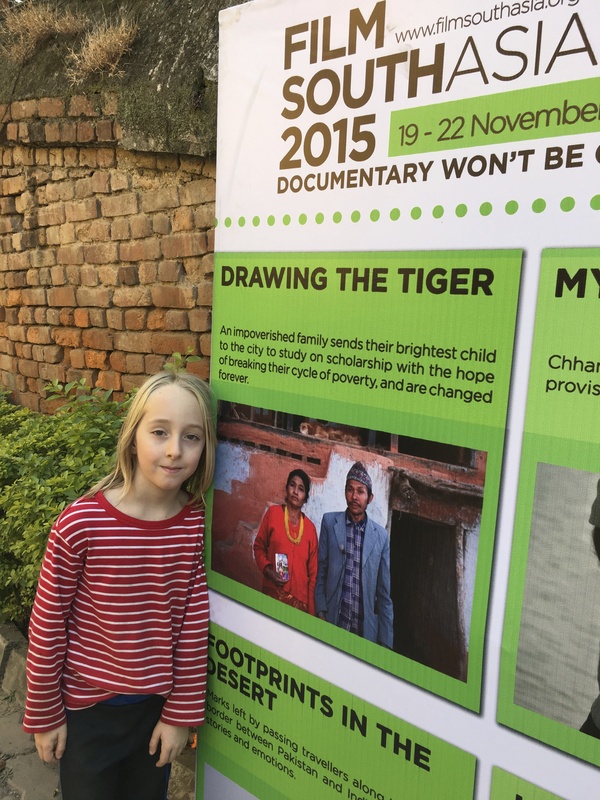 This past weekend Drawing the Tiger screened twice at Film Southasia—The Darnals, the family in our film were there for both. It was a wonderful whirlwind and we will try to process it here in photos and captions. There is so much to say and so many photos to post and the internet is oh so slow and our time here is so packed. But I feel if I don’t write some of it down now, the events that happen in the next two weeks will be eclipsed by the events of the last almost two weeks—and they were such big ones. So here is an attempt to summarize. Wait. Before I talk about the Drawing the Tiger, I want to reflect on how fun it is to have Hale, our six-year-old (almost 7-year-old as he spins it son here with us. 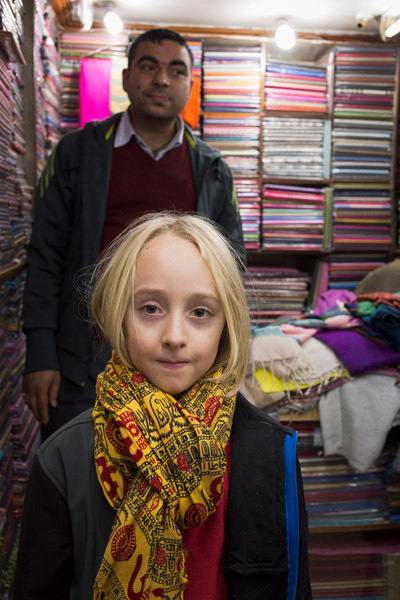 This his first trip to Nepal. He knows it is a big deal and (except for this morning when he totally he lost his marbles for a mystery reason. I escaped his wrath with the excuse I had to write this post. Sorry Scott.) he has proven to be a gifted traveler. Hale decorating his airplane collection while Kristin and Scott and I plan how we are going TO DO IT ALL! 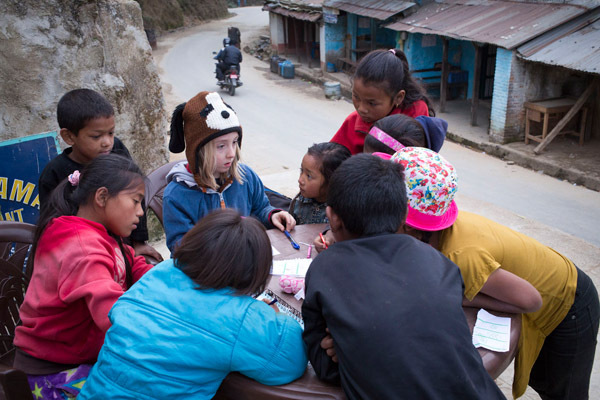 Hale coloring with new friends in a small town 35km outside of KTM. Everywhere we go Nepalis beam at Hale with smiles and small talk. Pretty much everyone assumes he is a girl with his long blonde hair. They have to check a few times to make sure? Chhora? (Son?) Chhora? He doesn’t mind a bit. 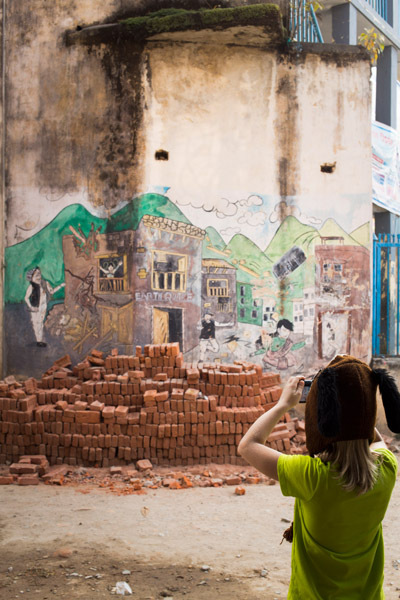 Hale taking a photo of an mural about earthquake safety. We photographed the same one in 2013. Making paper airplanes with The Darnals. He has been such a trooper. Falling asleep in restaurants and in meetings all over the city. YUM! Dal bhat. Oh, and luckily for everyone, Hale loves him some dal!!! It was very exciting to be in Film Southasia— ours was one of two films made by westerners in the whole festival—such an honor. It also made us a bit nervous. 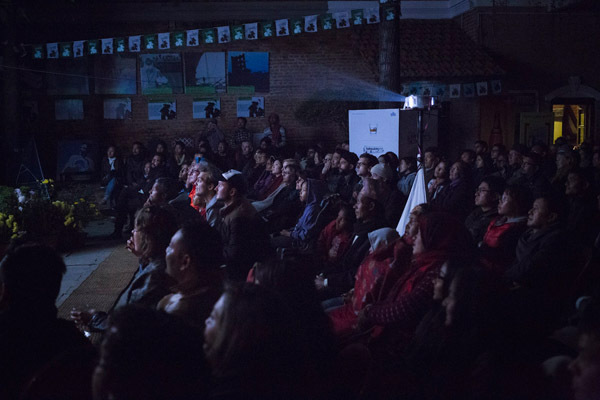 Despite having Ramyata Limbu as our co-director (who gives us street cred here in Kathmandu and who believes in the film) we were definitely anxious about what Nepalis were going to think about Drawing the Tiger. We were also nervous/excited about having The Darnals present for the film. Everyone in the family has already seen the film, but they watched it in the privacy of their own home. This is a very personal film and they were about to watch it in a huge hall with about 500 people. The day of our first screening, I was woozy and couldn’t eat. 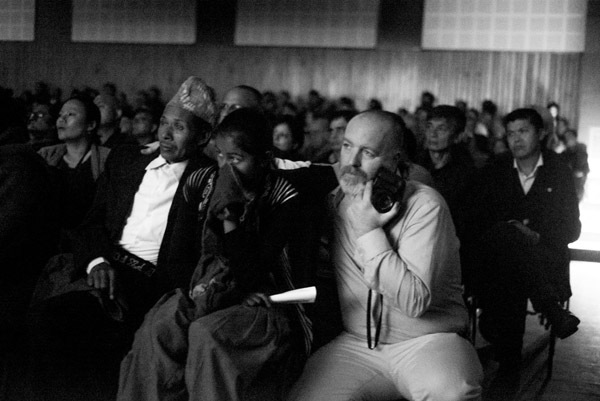 The Darnals, with some logistical help from Film Southasia, came to Kathmandu from the village via bus. Due to the fuel crisis, the tickets for the bus were completely sold out, but with a bit of strings pulling by the director of the fest, they secured seats. We went to their house to pick them up for the screening. I can’t put into words what it was like to see them again. It has been almost three years since we have seen them in person. And yet, they have been such a huge part of our everyday lives. So strange and awesome and it was SO SO SO good to seem them! They were so excited to meet Hale. This was our first screening. 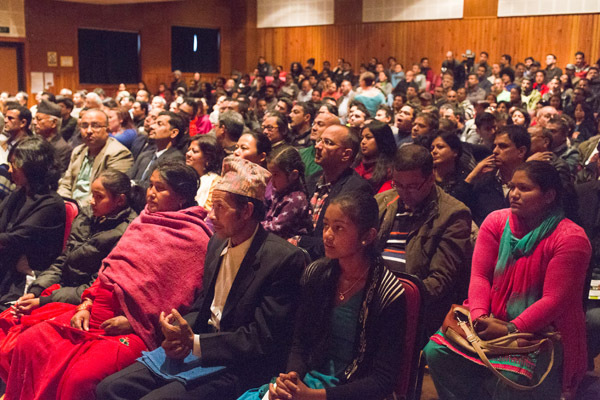 It was a HUGE hall, totally full, about 500 people. There were a few glitches—the wrong kind of projector was used and its beautiful color and resolution lost; the electricity went out at one point and then the sound suddenly cut out and the projectionist had to rewind some of the film. Que Bayo? What to do? That is what they say here. 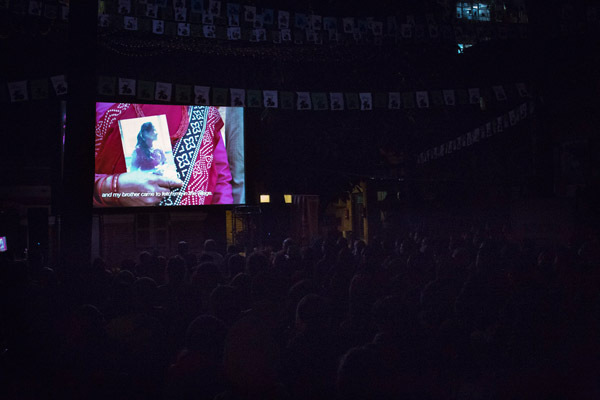 This is how I really knew we were screening our film in Nepal. The family cried some during the film. Scott leaned over Sarita to offer comfort to Buwah. Kristin and I were sitting in the back of the theater holding our breath for the The Darnals. Or, as Kristin put it, “I feel the years being taken off my life right now.” We were so much more worried about The Darnals than the electricity going out. The film is so personal. Afterwards, we asked the family what it felt like to watch it a room full of people, “Sure. It was awkward at times,” Buwah said. They are really remarkable people, the Darnals. It was not till the credits rolled, that I truly knew Drawing the Tiger was a big deal for us, a bid deal for The Darnals and a big deal for Nepalis. It felt too surreal to be a high— but my skin was tingling as we walked from the theater. 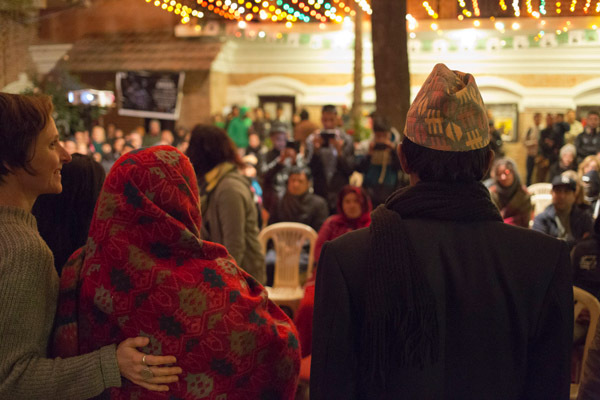 So many people said flattering things about the film—including a Nepali movie star (I later learned just how famous he is here “total A-list guy, man!”) and some of our big Nepali donors. The Darnals were surrounded. Everyone had either a question for them or just wanted to say ‘Thank you’. I heard many people say afterwards, “I can’t believe they were right there in the room!” Scott, Kristin, Hale, Ramyata, Shailendra and I walked with the Darnals to meet the taxis for home—and there was this sense that we had all done this big thing together and that we were going to continue to do it for quite some time. The second screening went technically way better. Scott worked with projectionist to fix the problems. It was outside in this courtyard and so beautiful. Everyone was so into it! Despite the fuel crisis which means finding transportation after dark is a serious challenge, most of the 450+ member audience stayed for the Q&A which Buwah and Amma rocked. Actually, the whole night could not have gone better. I just couldn’t believe it was happening—the whole time. Then the next night we won the UNICEF film award! A huge honor. 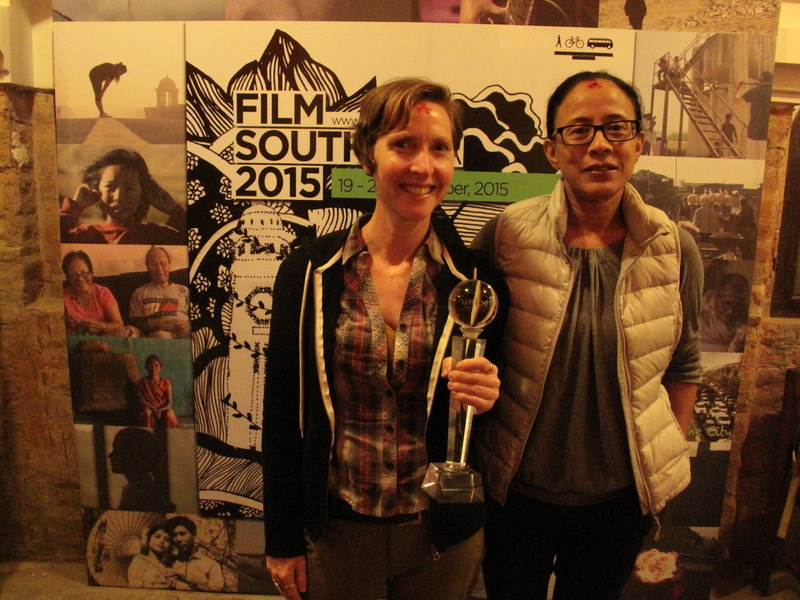 An award for Drawing the Tiger in Nepal from Nepalis. Unfortunately, Scott and Shailendra missed the awards ceremony because they were filming Kumar coming home from Malaysia. They headed out to the airport with Buwah to catch every moment of Kumar’s arrival. Documentary—you gotta go get it when it is there to get. And Kristin is missing from this photo because she was taking the picture. Just imagine the whole team here with the award, will ya? We are excited to have our long time DTT supporter and friend, Dan, here with us. He joined us last week for this grand adventure. He is an excellent photographer and logistical genius. 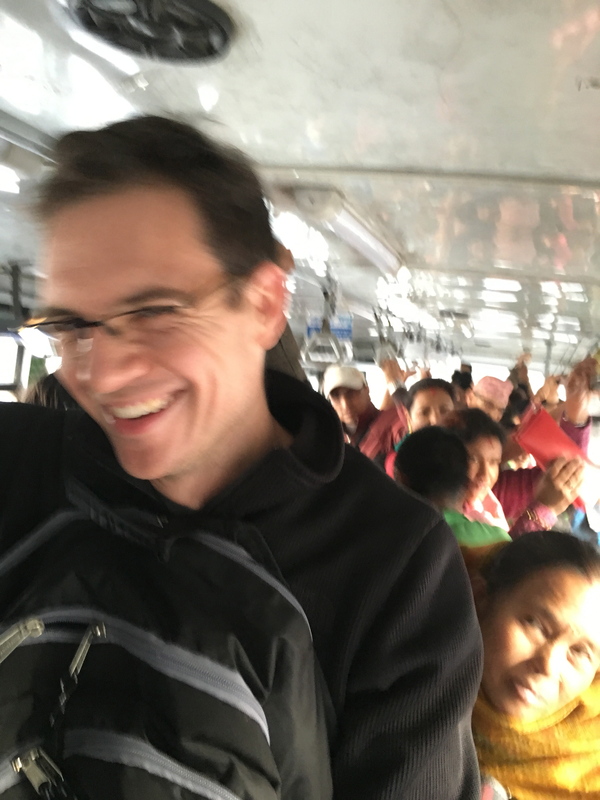 In just a few weeks, he learned up way more Nepali than either of us speaks, AND, he is NOT afraid of super crowded bus! We are so happy to have him here. Speaking of crowded buses—the fuel crisis here is serious. 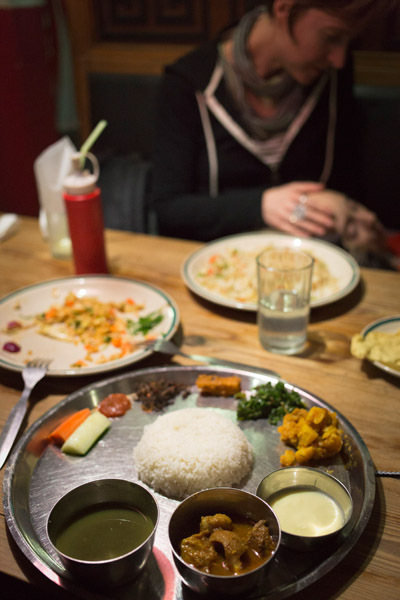 (A blockade from India). Transportation around the city is not easy. Taxis are SUPER expensive. Like, close to Seattle prices which is outrageous for this economy. Folks are running out of gas for cooking. Buses are SO packed. Today Kristin and I were in a bus shoved so close to other bodies— in any other setting it would be in totally inappropriate—and people were just laughing. “Que bayo?” a few people smiled and said. What to do? Having a good sense of humor about it is a great thing to do. I hope the laughter can continue to get this country through this very hard time. 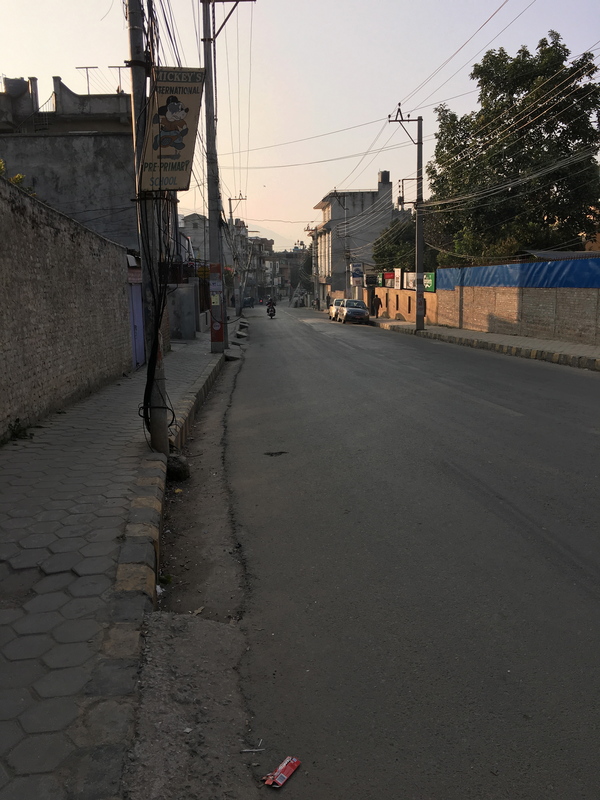 An almost empty street in Patan during a bandh (strike) over the fuel crisis this week. Wait. There is more. Today we screened the film at UNICEF office for the entire staff. Ashley Hagaman, who is here on a Fulbright doing PhD research on how suicide data is (or, too often isn’t) collected and reported in Nepal, as well as helping to create tools to help female Nepali volunteers identify the signs of suicide, joined us for the discussion afterwards. 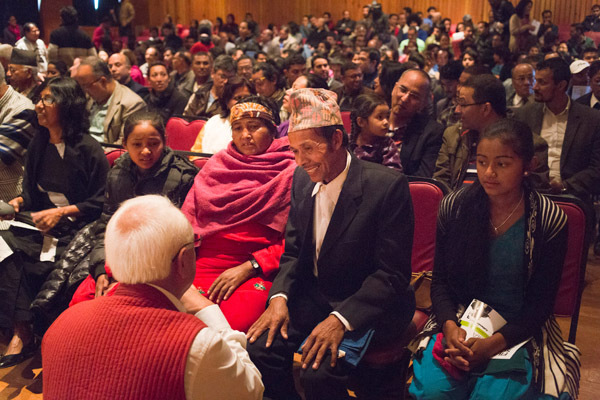 Everyone seemed really interested and had all sorts of ideas of who should see the film— the education arm of the Nepali gov’t for one. It just might happen! Stay tuned…. 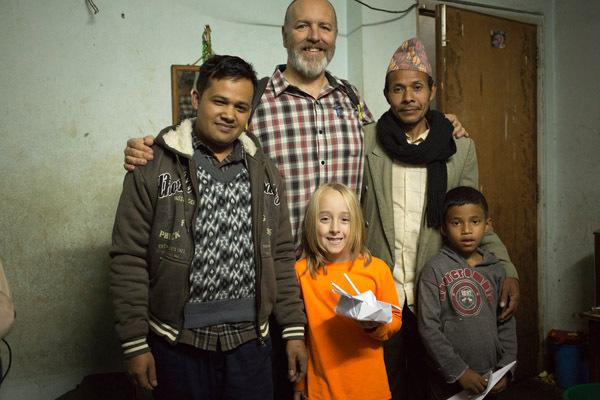 Tomorrow morning (well in just a few hours really—it’s pretty late here), we leave for the Darnals’ village in the Ramechhap district. We are excited! Scott right now is looking at different routes. Apparently there is a new road built by the Japanese and just dedicated post-earthquake. He has been poring over maps. We have a translator, Yopesh, a driver, Rajkumar, a big ole’ 4×4 (thank you kind donor! We could not be doing this without you!!! 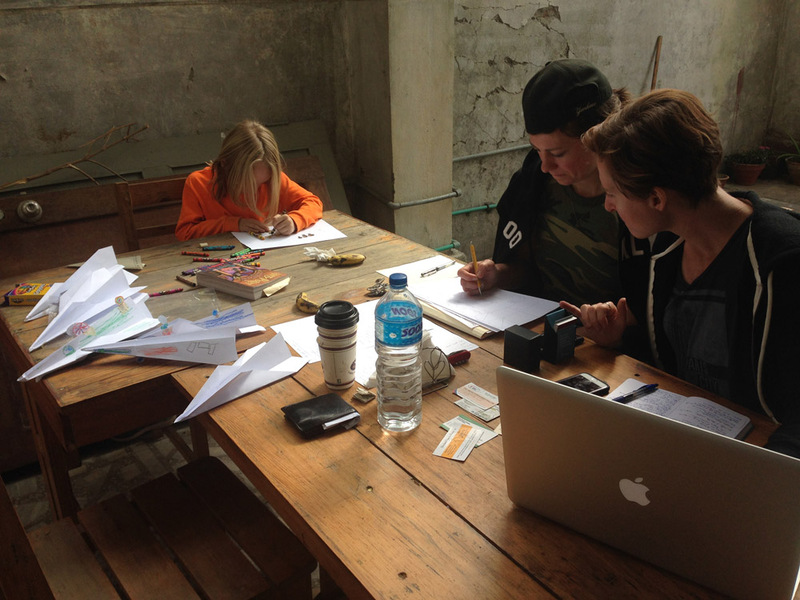 ), a tin of hard-boiled eggs, three systems to purify our water and lots of paper and colors for Hale to share with the kids. Kumar is coming with us. He has not been to the village for two years. It is going to be an adventure! Want more info about Drawing the Tiger? Here is our website. Here is our Facebook page. Drawing the Tiger On Demand @ Comcast/Xfinity!